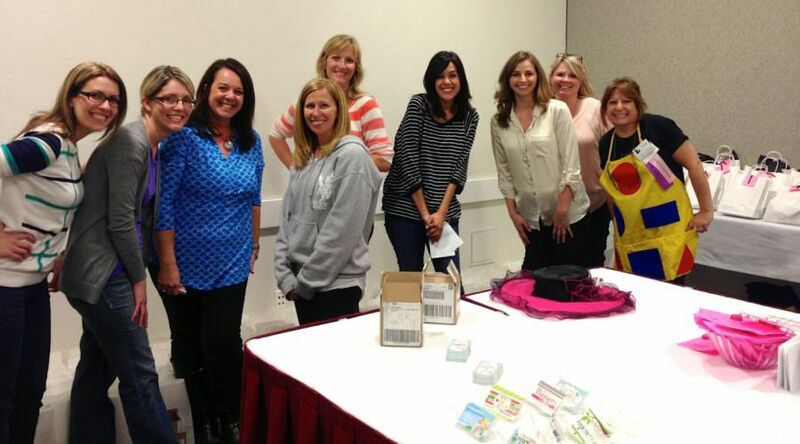 Conference Photo Share… it was BEYOND FUN! Ok… I promised pics from my “BIG WEEKEND” and I have some. Luckily for you I am in very few! Here are the details about the weekend…you’re curious, right? Teeny Tiny Kristin showed up at my house when it was POURING RAIN and super windy. We loaded my car and got absolutely SOAKED. We drove out to Pasadena in heavy SoCal traffic – but all was well. After we arrived at the convention center, we headed to the “bash headquarters” and began filling goodie bags with our fabulous friends. It was hot and little crowded in there – but the job got done! After a quick wardrobe change, we headed back to the conference center for Kristin‘s amazing presentation! A HUGE make and take of her Reader’s Theater… hilarious… fun! Then we had to set the same room up again for Annie‘s fabulous presentation on reading! The place was PACKED (over 150 people!) and everyone LOVED IT! She’s just awesome. Again, I kept myself busy helping – so no pictures. Trust me those girls looked adorable and their presentations were stellar. After that we had to run to the bash which was already starting fill up! And all of the attendees were grabbing their goodie bags! We all got up and shared a teeny bit! You can find a link to our presentation (with freebies!) on my last post! Here are some of the fabulous attendees. A lot of them are wonderful, amazing bloggers, too! We raffled off a whole lot of prizes. After the bash a bunch of us took a little time to just hang out and relax before heading to our hotel rooms. Then started all over again Saturday morning. We didn’t get to see each other present as much as we would have liked because several us were presenting at the same time. So we kind of slipped in and out and saw snippets here and there! It was incredibly fun and we were glad WE didn’t have to choose! (Thank you SCKC Director Channon Morris!!) During their presentations, we giggled with Deanna, sang with Heidi, common cored (it’s a word!) with Fran, explored writing with Kerry and Lindsay, and practiced phonics with Palma. I was a tad nervous about my presentation, especially after looking at adorable student pics and awesome student work in all of my friends’ presentations! But my attendees were fabulous and actually WANTED to learn about planning and organizing!!! YAY!!! We visited Hadar and Michelle for some classroom management fun. That pic is not from their presentation, but I LOVE IT! How ridiculously cute are they!?! After that we ended the conference in Katie‘s presentation room. We were exhausted and felt for her… it had to be tough going last after such a busy couple of days. If she was tired, you couldn’t tell! The room was packed and we willingly stretched out sat on the floor so all of the attendees would have a seat. Peeps… the whole thing was incredible. We had so much fun!!! Teacher energy and passion is simply fantastic and inspiring. That.is.all! I think I have a link for everyone in this post – be sure you go visit them all! They will have more to share. Were you there? Please leave a comment! Looks amazing and so much fun Traci! So many of my favorite bloggers in one place!! I am really looking forward to Vegas!! Carol is was so wonderful to see your wonderful face these past 2 days! Thanks for attending my session. I feel so honored that you were there! I'm so sad I couldn't make it. Looks like you gals had such fun! Your post is AWESOME!! IT really was the best weekend ever! Can't wait to do it again…in VEGAS!! 🙂 Thanks for being AWESOME SAUCE!!! My grin is from ear to ear. Thank you so much. I love you to the moon and back lady – you're AMAZING 🙂 This weekend was priceless . . . I can't wait to hang with all of you again. I definitely left my heart in SoCal! LOVED every minute of it!!!! Would not have been the same without all of my favorite people there! LOVE YOU!!! Your blog post was just like Palma said. We DID get to relive it! You ROCK sister! Great pics, Traci. Glad to hear you had so much fun. You're very brave, too! I don't think I could ever get the courage to present.